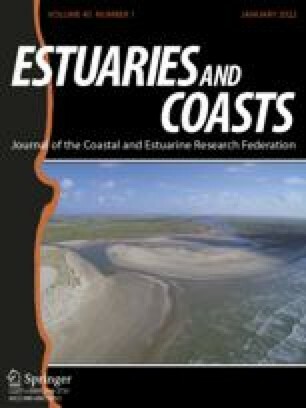 Tidal freshwater marshes are critical buffers that exist at the interface between watersheds and estuaries. Little is known about the physical dynamics of tidal freshwater marsh evolution. Over a 21-mo period, July 1995 to March 1997, measurements were made of biweekly sediment deposition at 23 locations in a 3.8-ha tidal freshwater marsh in the Bush River subestuary of the upper Chesapeake Bay. Biweekly accumulation showed high spatial and temporal variability, ranging from −0.28 g cm−2 to 1.15 g cm−2. Spatial variability is accounted for by habitat differences including plant associations, elevation, and hydrology. Temporal variability is accounted for by interannual climate variability, the growth cycles of marsh plants, stream-marsh interactions, forest-marsh interactions, and animal activity.